HRT dSp review | What Hi-Fi? The hairy, spiky Rambutan fruit hardly screams ‘come hither’ to food shoppers, but give it a chance and from that moment onwards, no other exotic fruit will do. The same goes for the HRT dSp. An uninviting plastic design that looks nothing more than your average throwaway USB key casing, is actually a wonderful thing. Once you’ve tried it, you won’t want to be without. High Resolution Technologies (HRT) calls it a digital sound processor. To you and us though, it’s a DAC. HRT has a handful of tiny portable DACs in its portfolio. Its microStreamer won an Award in 2013, taking the gong from the original Audioquest DragonFly before the DragonFly v1.2 nabbed it back last year. HRT strikes back again, only this time it separates itself from the computer-only competition. 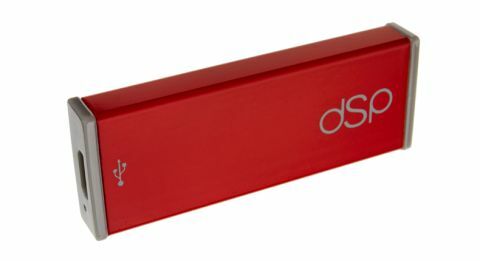 The beauty of the dSp is that it can be used with range of portable devices; one microUSB-ended cable connects it to smartphones and tablets, and another USB-ended one is for PCs and laptops. Both leads are supplied and plug into one end of the dSp, while your headphones go in the other end’s 3.5mm jack. The dSp works with anything that runs Android Lollipop (LG G4s, Samsung Galaxy S6s and Sony Xperia Z3s, for example), Chrome OS, Windows or Apple OS X. According to the HRT’s packaging, some devices running Android KitKat are also compatible. So what about iPhones and iPads? Unless you have an old Apple device with the original 30-pin connector (like the iPhone 4S and 3rd-gen iPad) and buy an appropriate adapter, you’ll have to buy the dSp’s purely Apple-centric sibling, the i-dSp, instead. That comes with a lightning connector pre-fitted. The dSp supports a range of audio formats including MP3, AAC and FLAC (up to 24bit/96kHz), and is firmware-upgradeable to accommodate future updates. Smartphones may do a thousand things, but good sound is rarely one of them. Want better? You could empty your wallet on – and fill another jeans pocket with – a second device. Or you could invest in something like the dSp. Plug it into an LG G4 and clarity, detail and bass is jacked up a treat. A 24-bit/96kHz recording of Muse’s Supremacy comes into being and an involving sense of life and vehemence clings to the orchestration and guitar riff. The dSp has a good stranglehold on bass notes, the track’s penetrating drum slaps are taut and precise, and energetic when they need to be. The HRT is careful not to tip the tonal scale, also giving mids and highs bragging rights to decent clarity and insight. Bellamy’s vocal reach isn’t hampered and cymbals simmer until they shimmer and fall from grace. There’s enough space around instruments and the housekeeping to make one of the band’s most sonically anarchic tracks sound uncluttered and cohesive. It’s an upgrade in almost every way – not only with the LG, but Sony Xperia Z3 Compact and Samsung S6 too – timing and rhythmic know-how included. It instantly finds its stride with the perennial piano structure of Kanye West’s Dark Fantasy, and dynamic variances in his voice and the backing vocals are plain to hear. Take the HRT out of the equation and the scale of the song’s immense production feels flatter and stripped back. Over to a MacBook Air (swapping over the HRT’s lead in the process) and the HRT proves a consistent performer. Play Hans Zimmer’s You’re So Cool and the xylophone notes ring through with more fluidity and subtlety than they do straight out of the MacBook’s headphone output, starting and stopping in stricter fashion. Vast compatibility with a range of devices is the dSp’s selling point, but if it’s purely laptop sound you’re looking to improve, the Audioquest Dragonfly v1.2 (£130) justifies the extra spend with greater clarity and precision. Giving our everyday devices the gift of better sound is something we’d like – but cannot always afford – to do. The £80 HRT offers a cheap, easy and functional way in, and a good one at that. It adds clarity, precision and detail in spades, and its Lego-piece size merely makes it an unobtrusive and pocket-friendly extension of your headphone cable. After trying out the dSp, there’s no going back to basic smartphone sound.